When I was 23 years old, I left Ireland and moved to New York. Before I left, I did the responsible thing, and went to the dentist. I’d heard that American dentists charged and arm and a leg, so I went for a check-up while I could afford it. “Okay,” I said, and she got out her drill and buzzed away at one of my amalgam fillings. It’s actually very common for people to have their amalgam fillings drilled into without any kind of protection put in place, it’s not just something that happens in Ireland. Vast quantities of mercury vapor — the most readily absorbed form of the toxin — are released during the process and inhaled by anyone present in the room. Dentists perform this risky procedure on a regular basis because for 9 out of 10 people, it’s not a problem. Their bodies can handle and excrete the one-time super-high dose of mercury. But as you’ve probably realized by now, this blog is not about those 9 out of 10 people who are impervious to the effects of mercury. 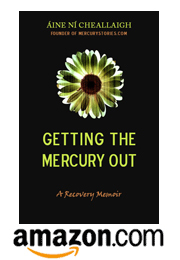 For the other 1 in 10 people (or 1 in 50 or 1 in 100, the stats haven’t been compiled yet) their genetic makeup dictates that they will get into serious trouble if they encounter mercury — even at the low doses that most people can handle without a problem. I am, of course, part of that sensitive-to-mercury minority. For me, drilling straight into amalgam with no protection was a crazy move. When I think about that incident now, I sigh. It’s just one more blunder in a long list of screw-ups and accidental exposures that could have been avoided. That should have been avoided. But I didn’t know. I can only assume that that Irish dentist didn’t know either. And until everyone knows, I’m going to keep talking, I’m going to keep writing, I’m going to keep putting the message out there. Listen up folks: there are people out there whose bodies can’t handle even teeny tiny doses of mercury. Maybe your body can, but theirs can’t. Could you please stop the poisoning? Please?